When you leave it out in your home, your cat sees it as a regular part of her space. She can enter and exit the carrier easily and become familiar with it. The carrier acquires the smell of your home instead of smelling like the basement or garage. Gently place your cat into her carrier. If you need your cat in her carrier and she isn’t entering it by herself, carefully scoop her up with both hands and support her bottom. Then gently place her into the carrier. You want your cat to trust you when you pick her up, so handle her carefully and move slowly to avoid causing her fear or pain. Many cats have arthritis in their neck or back. 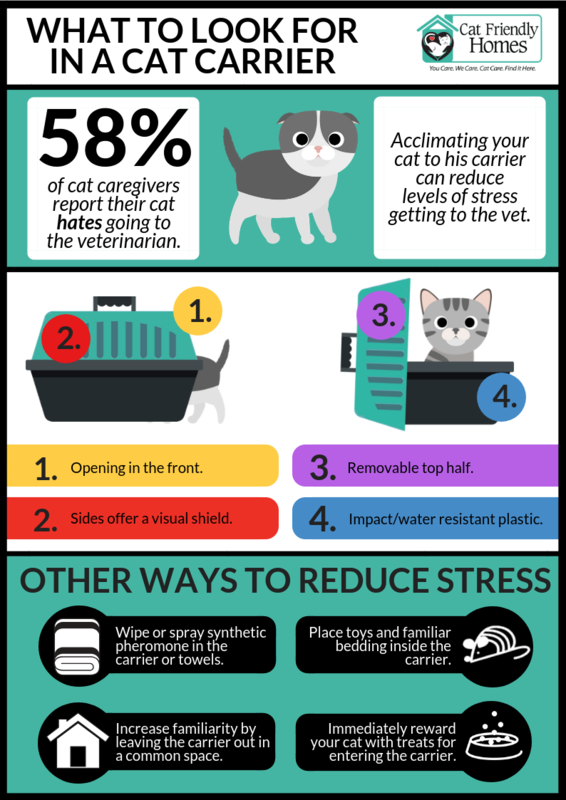 With proper and gentle handling you can avoid causing your cat pain in these areas. Treat your cat with respect. Even when you are in a hurry, take care not to drop or shove your cat into the carrier. This may cause her fear and she may try to bite or scratch you. Instead, if you are desperate to get your cat into the carrier, toss a blanket over her, gently wrap her like a burrito – being careful not to pull the blanket too tight – and slide her into the carrier. It’s similar to swaddling a baby. Remember to line the bottom of the carrier. Your cat prefers a soft, comfy place to sit. Try placing a blanket or towel in the bottom of the carrier and spray it with a feline facial pheromone, (allowing at least 30 minutes for the spray to dissipate) so the carrier is not as frightening to her. If you try too hard to get your cat into the carrier, she may get suspicious. Instead, place treats, toys, or catnip in the carrier. With patience and time, your cat should come around.